Was planning a 8-10 day tour in Greece this May but haven't been able to find a route I'm happy with so am thinking about doing Corsica or Sardinia (or both!). Does anyone have any experience in either (or both!). I'm looking to do a 300-400 mile ride that I'll be doing solo and unassisted. Trying to avoid serious climbs as I am by no means a professional cyclist. I've plotted a few routes but unsure how exactly to read the elevation profiles (not sure what 1000m at a 6% grade looks like in real life). Alternatively, if anyone knows a company in Italy/France that sells routes that would work too! I toured on Corsica and found it to be one of the best touring destinations in Europe. It's beautiful. It is not flat, however. 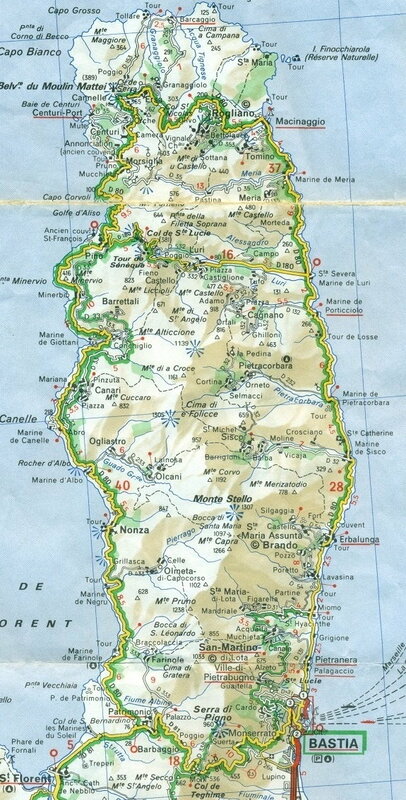 The only flat roads are along the east coast, but that is also the least scenic part of the island and has the most traffic. But the cycling on Corsica was easier than on the Peloponnese of Greece, and the scenery even nicer. I arrived by ferry in Bastia and rode around Cap Corse (gorgeous), then a road near the northern coast, also great scenery. The west coast has even nicer scenery. It's not terribly difficult but it's not flat. I also rode in the interior and rode up a pass in southern Corsica and had a nice view of northern Sardinia from the top. It would probably be best if you avoided the interior, however, since it was more difficult riding that any of the coastal riding I did. My trip was in mid-June. I had great weather, but a few campgrounds weren't open yet. I've researched Sardinia because it's a place I'd like to go touring. It's not as mountainous as Corsica and it's drier. The cycling looks like it would be easier than on Corsica. A friend biked there as well as Sicily, and he preferred Sardinia. (He toured on Corsica and liked it very much, too.) He said there was less traffic on Sardinia than on Sicily. He said that coastal Sicily had too much traffic, but interior Sicily lacked campgrounds. He didn't have problems finding campgrounds on Sardinia. My research also found that there are a fair number of B&Bs on Sardinia including agriturismo, which sounds quite nice. Sardinia would probably have better weather in May than Corsica. I took a very short trip in Corsica, taking the ferry from Nice to Calvi and cycling a short distance down the western coast to join up with friends at a hotel in Porto . The 43 miles from Calvi was the most spectacular coastal riding I've done anywhere with occasional turns inland. Yes, there were many climbs but none were too long. Click on the link below and zoom in to show the coastal D-81B. Drag the Google Street View tool over the route to see the views. Sorry, I didn't take any photos on that trip. I met my friends at Porto and we did several day rides in the area. We rode inland one day and stayed at a hotel at a mountain town (Evisa?) I then returned to Calvi repeating the same spectacular route! I've ridden a lot in mountainous terrain, and personally I enjoy it, despite the hard work and very slow average speeds. given that you will be carrying camping gear, its fairly realistic to assume you'll be carrying 30, 40lbs of load (water and foodstuffs included) so the most common sense approach is to have some sort of loop in your area with climbing involved, figure out how many metres is involved, and do a bunch of loops and see how it feels to climb X meters in X kms. there are free phone apps like "maps.me" that can plot routes and sort of give altitude gains, and you can download OSM open source maps , for countries all over the world to put into your phone or tablet so that maps.me has the maps for a given place. maybe you have a fancy gps bike computer, or a phone app that can be on during a ride and will tell you altitude gain over a ride. no matter how, getting a real idea yourself, with all the stuff on your bike you plan to take, will give you real world ideas of , "ok, if I'm climbing 500 meters in a day over 50kms , this is what it will feel like"
for me, I find a 1000m climbing day to be a reasonably hard day. Its tough if you havent done much hill riding loaded, or unloaded, as a big part of climbs is having the right low gearing to make things easier for your legs and knees, and 2- the mental getting over aspect that is tough when you havent experienced it before, and can be disheartening. the main mental trick is to find a gear that works well with enough cadence to not overtax you, and just plod along, let your mind wander, and the more you do it, the better you get, like anything else. proper low gearing and not taking too much junk is crucial though. so good luck with riding loaded , get out there and keep at it. ...for me, I find a 1000m climbing day to be a reasonably hard day. 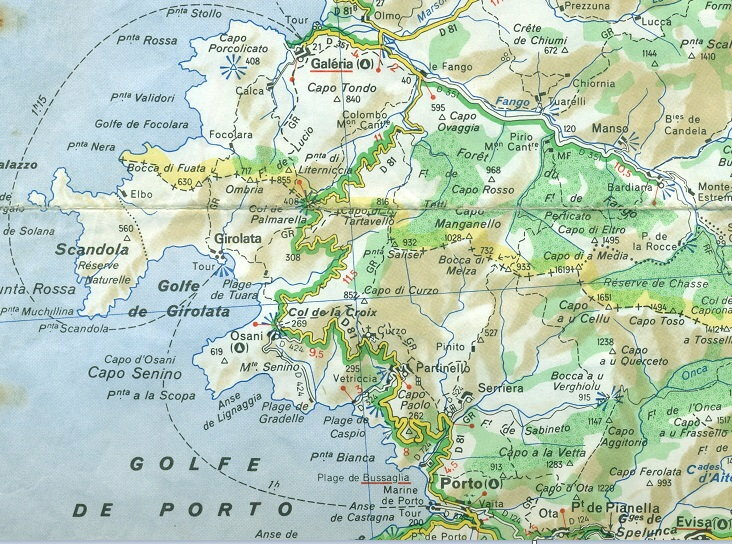 Hmmm... That 43 miles from Calvi to Porto may have been harder that I remember! That big climb was between Galeria and Osani. cool Bob. 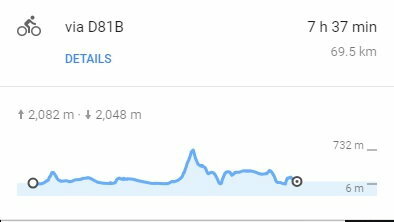 I think the most Ive climbed in a day is about 2200 m, in the Pyrenees back in the 90s, probably was carrying 35-40lbs on a 30lb bike, dont recall distance but probably in the 50km range. Recently, I think the most is about 1800 , in about 50km again, but carrying more stuff, maybe 55lbs? I'd have to check my notes. Long days in any case, buts its great to be able to get this info with a few clicks nowadays. Back then we just had to look closely at the Michelin maps and look for how many chevrons were on sections that were climbs, 1=so so, 2=hard, 3=pretty darn hard , and then guesstimate or use a piece of string to roughly figure how long the climb was. nothing like a good old paper map. Still like having one. FWIW, I've spent many summers in Corsica and Sardinia. (sailing). Both are great, albeit we prefer the latter. Cagliari is a very pleasant town. Riding an open jaw between Cagliari and Olbia is certainly doable : 320km or so. There's a big climb halfway, north of Tortoli (Arbatax) (1000m over 30kms). You can stop halfway up/down in small localities, and there's nothing wrong pausing on climbs, or walking your bike when it gets really steep. May should be a good time. Warm but not hot. No swarms of tourists. Feel free to ask questions. Have a great trip -- this could be as close to paradise as it gets. This is perfect! I didn't necessarily need to do Corsica as well as Sardinia so may just opt for Sardinia. Any idea what route your friend took when he was there? Thanks so much for taking the time to respond. Thanks so much for the tips! I live in NYC so difficult to find too many hills that would compare to anything on either of these islands but will keep your advice in mind when I get out there! Thanks so much. This is immensely helpful. 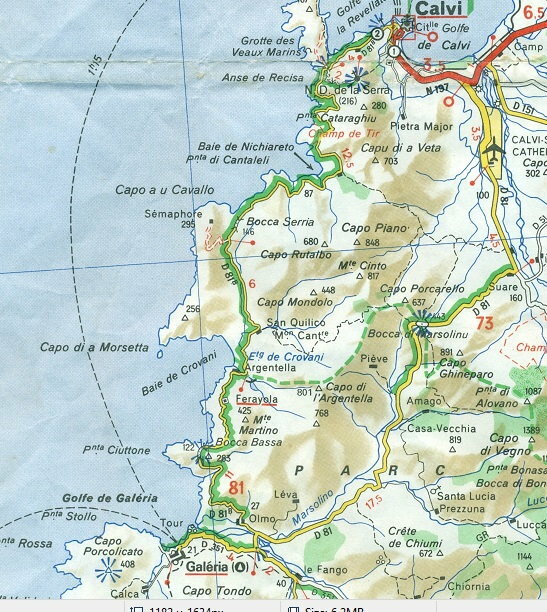 I plotted out a tentative route starting in Cagliari and heading north. It won't let me post a URL to the route because I don't have 10 posts unfortunately.... Anyone know another way I could share the routing URL? I remember watching TdF coverage several years ago when the race had a few stages in Corsica. The interior looked absolutely stunning, but definitely hilly. well New Yorker, May is a coming quickly my dear! Do you already have your gear, tent, sleeping bag and all that jazz? What bike are you using, I can't recall if you have mentioned this, I didnt think so. 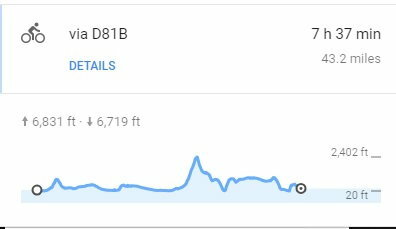 Although you can't get hilly rides in easy, I highly recommend getting out as much as you can with all your panniers and stuff, just so your legs slowly get used to schlepping a heavy bike along. The by product of riding loaded is that we have to work harder, so this will show up any fit issues, ie like your seat too low, not a good seat to bars distance, as well as mundane stuff like how your bike shorts are for comfort, your shoes, whatever. Generally its always good to follow the old rule of not going on a bike trip with new stuff (or a hike or whatever) because finding out on your trip that the new bike shorts, or new seat is giving you a sore keester or whatever, or you are getting blisters or sore feet from your shoes---you get the picture, in other words, hopefully you have your bike and clothing sorted out, simply cuz multiple hours on your bike over multiple days will show up stuff, and noone wants to deal with this stuff when on a vacation we spent money and time on. and heck, even putting sacks of potatoes in your panniers is better than nothing, and riding as much as you can. ​​​​​Maybe try to trick the soft by replacing . with spaces, dashes or something else? You used gmaps? List a few towns you are going thru? And I have fond memories of Dorgali, where streets are so narrow that we scraped the paint of our rental (luckily, full insurance coverage is mandatory And actually, also got scratches from boars venturing close to our (another rental) car somewhere nowhere. Kids loved it. Travel guides will not emphasize how incredibly great fruits and vegetables are, in season. Trying again...seems I've finally reached 10 posts. Hope this works! Thanks again for the advice. I also figured I'd stay away from the costa smeralda as I'm not looking for anything super lux. Will also look into the Michelin guide! Your route looks good. It avoids the mountains and goes thru several great towns. Not much to say, as we spend little time on the western side of the island - usually pushed by gale force winds (mistral), which wife and kids consider as the price to pay to spend our summers there (I kind of like it... ) we stop once we've rounded the island, usually pushing it to Cabo carbonara, SE tip of the island. A few comments. 1. Not clear to me what your plans are wrt flying out. My guess would be Alghero. JFK-CAG-AHO-JFK is horrendously expensive on Kayak. You ll perhaps want a JFK-Milan return and fly low cost from there (The logistics could be a challenge with a bike. There are almost certainly decent options from Malpensa.) We usually fly via Paris (CDG and/or ORY). Changing airport with a bike makes for a memorable holiday. Not sure what kind of memories... Try to stick to one. Otherwise plan a layover to visit the city. 2. You may want to read this blog entry. I found myself agreeing with most advice. 3. You can't go wrong. Plan with breathing room to avoid rushing to destination. Worst case is to leave your bike behind. Find a nice kid with dirty clothes. Thanks for the tips and your time! Elevation profile seems easier, and I could continue along the north coast to the port where I plan to get a ferry to Nice. 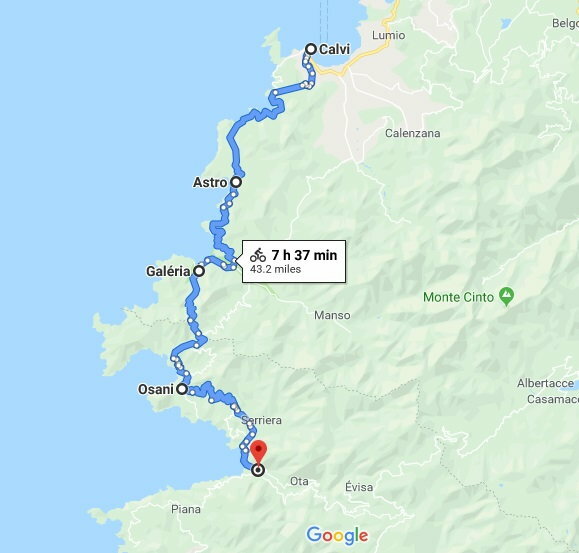 My plan is to fly into Caligari (via Rome as you suggested) and then maybe follow the route above north and then continue along this route https://italy-cycling-guide.info/cyc...a-north-coast/ until I reach the ferry in Porto Torres. Any thoughts on that? Anything on the West coast I'd really be missing out on? Also thanks so much for that blog! An amazing resource. hope its nicer than here this weekend. I just got back from a little ride because I see we are in for about 4-5 days of rain starting tomorrow. We are very lucky in Mtl, like in NY there is a large park in the middle of the city, designed coincidentily by the same guy who did Central Park, but here there is a small mountain, Mount Royal, and its my go to "ride for hills and exercise" area, cuz in an hour or so ride, I can climb 250 or 300 metres, 750-1000ft for you Imperialists ;-) and the view at the top looking over the city, the St Lawrence river and onto Vermont is always pretty. Thats great that you will be riding with your stuff. Ive ridden in upstate NY and some places are pretty darn hilly, but very pretty as I'm sure you know, so have a good time. About how much does all your stuff weigh? The Sequoia has been around for a while, in various iterations, I hope the gearing that you have works alright. Depending on your load weight compared to last year, you can get an idea already of how it will be for hills. I could go on about gearing and bore you to tears, so I'll stop. If you don't already use a mirror, I highly highly recommend one. Having those few extra seconds of knowing what is coming behind you can literally be a life saver, not to mention simply being more relaxing because it takes the guess work out of sketchy situations that sometimes arise. I can only speak for France and other countries for folks in cars generally being patient with cyclists, but Ive never been to Italy, so perhaps the others here can give you a heads up of what (generally) to expect. When I was touring in Banff NP in Alberta, I met an old guy from Alberta who wasn't on a bike. When he found out I was American, he said to me: "I like to go to the states so I can buy my gas in gallons." I suppose there were some Canadians who went metric kicking & screaming. I'm guessing that a lot of them lived in Alberta. but oddly, in normal life, I use feet and inches for height, lbs for weight, lbs and kilos for food stuffs, kph and kms, but mph is second nature, metric for fluids, celcius for temps....and Im pretty typical, its a mish mash, but all in all, metric is an easier system to use, but we still use imperial stuff often.